Just when you think you have nothing to post on Friday, good public relations firms send you press releases like the one you will find below. If you regularly read this site then you probably already know about the incredibly affective non-profit group No Longer Empty. They have recently championed an empty storefront mural project with two incredible works by D-Face and Know Hope. Most recently we suggested they work with GAIA, whose mural was produced last Saturday and we anxiously await its release. We have been excited about this format as a viable way for some of today's leading street artists to find legal ways to bring their work to our city. Before we have had time to even remotely enjoy the possibility of a city filled with outdoor murals, the Mediacy ad agency (which doesn't even have a website yet) has stepped in to cash in on the abuse of our public environment. One thing I can tell you is they will need permits to put these ads up and you can be damn sure we will be calling them in to 311 as we see them. On another note, there seems to be one InWindow advertisement up in the city that I know of and it has been a month at least since I saw the last one go up. I can't be sure but I hope the AAA and PAC had something to do with this, however small. Love the use of the Kandinsky for this press release. Are they really to have me believe they will be putting up art and not two half naked people screwing each other? NEW YORK – November 12, 2009 – Mediacy, Inc., an innovator in the out-of-home media segment, introduces its newest division: Mediacy Outdoor, and their latest marketing platform: Gatescapes. Gatescapes, made of specialty vinyl that is specifically cut for corrugated gates (roll down storefront security gates), make use of what cities have an abundance of: protected entryways. 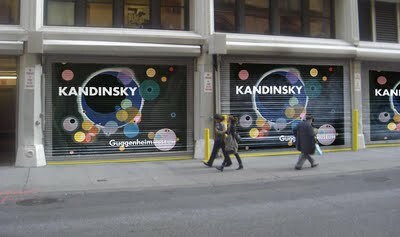 Mediacy Outdoor offers companies the chance to brand these gates with their logo. The ads will be featured on the gates of venues which are closed permanently or for at least 15 hours per day. Locations chosen have an average of 25,000 impressions per day based on Department of Transportation numbers, are illuminated by exterior lights during nighttime hours, and are large enough to be seen by foot traffic and vehicular traffic alike. These spaces are available immediately with the option of either a two week or four-week campaign. 500 gates will be available in each market priced from $1,500 - $30,000 depending on the size and the duration of the campaign. Locations are currently available in both New York and Los Angeles, and are poised to expand to the top 10 DMAs in 2010. Mediacy, Inc. founder and CEO Michael Gitter states that besides the urban beautification that comes with the cleaning, removal and prevention of graffiti on these gates, Mediacy continues to be: “a company in tune with the needs of advertisers in this difficult market.” Additionally, Gitter says that their Gatescapes “meet all the criteria for a Mediacy product: an expansive canvas for the message; innovative concept; effective media; uncluttered ad environment; colorful and visible." Gatescapes extend far beyond the reach of existing media vehicles, offering a cost-effective alternative to traditional advertising methods. Mediacy, Inc. continues to provide for the delivery of a customized message toward targeted consumer audiences on a platform which is guaranteed to astound, pushing the envelope for what place based marketing can accomplish.